Roses are associated with messages of love and affection. This bouquet includes spray roses and, with each upgrade, you will receive an additional 10 heads! With a variety of colours all skilfully arranged together, you can be sure that this bouquet will leave the recipient feeling stunned and loved! 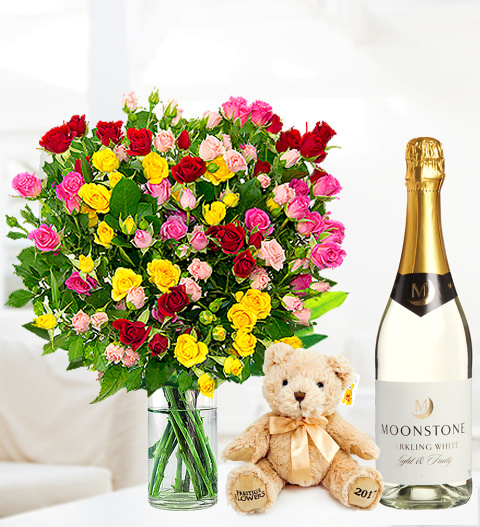 To compliment this beautiful arrangement, we have included a cuddly bear, a 50g box of luxury Belgian chocolates, and a 75cl bottle of Sparkling wine. This flower arrangement is arranged by our expert florists and available for UK next day delivery. Chocolates may contain nuts.